How to change someone else’s behavior? Is this what you are thinking for long and have searched hundreds of websites and you are still looking for the answer that you want to hear. Well, then listen to yourself first. What is it that you want to change in someone else? Is it something related to his beliefs? You might have definitely tried to resolve this issue on your own but still haven’t got any success! First of all, it is important to know whether you can change a behavior or not. Knowing the amount of control you have over the other person is very important. Then in order to successfully bring change in someone else’s behavior, it is very important to see why that change is needed and what is preventing the other person to bring that change in him. Remember, changing behavior means changing beliefs that are deep rooted! You cannot bring change by nagging or coercing or otherwise you will receive a negative reaction. You need to have the right process to do it! So let’s see how to bring change in someone. This is something really challenging! This sort of behavior is a long term behavior and requires patience and caution. Keep in mind that you will have to change the belief so first confront an argument with that person in a friendly manner about that behavior, and then slowly and smoothly win your point of view with a lasting argument! Lasting arguments are very important in changing long term behaviors as they make lasting impacts! Have you ever realized that most of us sometimes carry even weird fashion by getting influenced by media! So “Influence” is one of the greatest tools by way of which you can change someone’s behavior. So get into a good relation with the other person and toss the behavior that you want to see in him. Somebody is treating you badly and you simply do not want this! How to go about it? Again the belief system needs to be changed! 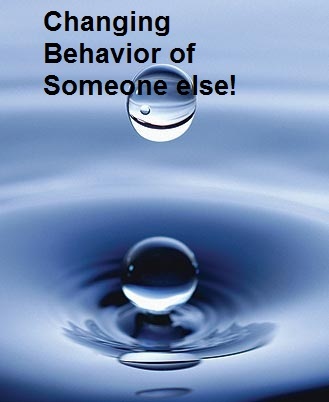 So if you want the other person to behave with you in a decent and nice manner then you will have to be like one, because the relation you have with the other person is the reflection of your own behavior. There is something that you want the other person follow all through life! So in order to bring that consistent change make a lasting impact with appreciations! The appreciations can be tangible rewards or simply words that the other person might be requiring from you.